Editors Note: There are 4 photos associated with this press release. 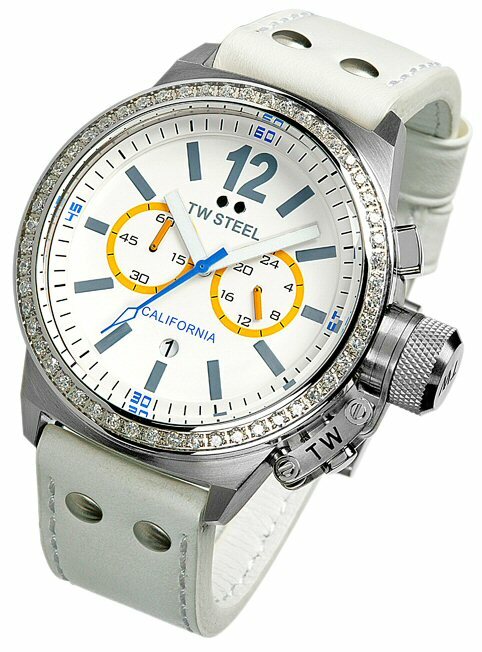 TW Steel together with California Tourism is pleased to announce the launch of a limited edition California watch collection that incorporates the refined, exceptional quality and luxurious styling of TW Steel's CEO collection with the sunny warmth of California. 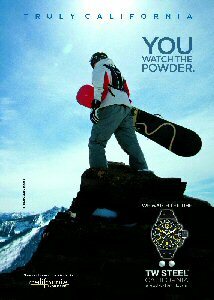 The Limited Edition California watches are ideal for the beach, the slopes, the bars and the boardroom. The new TW Steel California collection features both male and female executions, boasting 50mm (male) and 45mm steel (female) cases. Each model features the CEO Canteen hook and crown cap that acts as a protection for the crown and offers extra water resistance. As with all TW Steel watches quality is everything so both executions feature a dynamic OS21 chronograph movement from Miyota which measures the time with 1/1 a second accuracy. The oversized 50mm steel case has been sandblasted and plated with strong titanium to deliver a bold, masculine appearance. The California yellow detailing is present throughout from the tachymeter on the black aluminium bezel, the minute markers on the black dial to the stitching on the soft leather strap. Water resistant to 10ATM. The stylish and sporty ladies watch has a 45mm steel case and a bezel encrusted with 52 zirconias, the dial is matt white and has a grey printed index with yellow and blue accents. The finishing touch to the CE1043 is an elegant white strap made from the finest Italian leather. Water resistant to 10ATM. "The new collection reflects the enviable Californian attitude for life that makes anything possible and everyone welcome. The slick yet sporty watches are well suited to any situation or landscape you might find yourself in here – from skiing in the mountains or relaxing on the beach, to playing in the cities or exploring the Golden's State's natural outdoor wonders. We feel the California collection combines all that is truly Californian." – says Caroline Beteta, President and CEO of the California Travel and Tourism Commission (CTTC). "The watches in the California collection are really striking unique pieces that reflect the feel of the incredible diverse state of California. We feel that there is real synergy between the mind state of California and TW Steel. This partnership is being exceptionally well received by both customers and retailers. The advertising creatives that will feature throughout the UK lifestyle media are exceptionally strong and are reflective of the mentality and lifestyle that both partners convey." – says Laurie Milne, Marketing Director of TW Steel UK. To celebrate the launch of the TW Steel California collection, California Tourism has launched a nationwide competition for one lucky person to win a holiday for two to either Huntington Beach or Lake Tahoe. 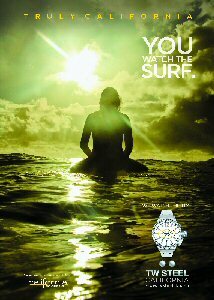 For more information on how to enter the competition, visit www.twsteeluk.com/california. California Tourism, is the UK representation of the California Travel & Tourism Commission (CTTC), a non-profit organisation with a mission to develop and maintain marketing programmes – in partnership with the state's travel industry – that keep California top-of-mind as a premier travel destination. According to the CTTC, approximately 663,000 travellers from the UK visited California in 2009, the majority on holiday. With an annual statewide spending impact of $875 million, visitors from the UK and Ireland are a significant part of the California tourism business. For more information about the CTTC and for visiting California visit www.visitcalifornia.co.uk. TW Steel stands unique amongst its rivals concentrating exclusively on continuing to develop and lead the oversized watch market it established with the introduction of its first collection in 2005. TW Steel, the name meaning 'The Watch in Steel', has rapidly established itself as a big, bold, lifestyle brand. Its collections are reflective of, and available for all tastes and occasions without compromise to design or build. Successfully combining design and innovation, TW Steel offers a defined sense of individuality with style and quality assured. Anybody can wear a TW Steel watch – Anybody can buy a TW Steel watch! 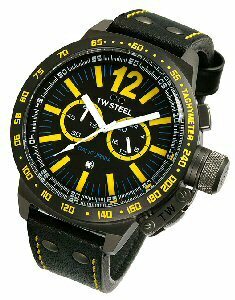 www.twsteeluk.com.